No real surprises here as our favorites all advanced with ease. In a wind legal seasonal best, Serra's Jazmyne Frost held off Calabasas' DeAnna Nowling, 11.57 to 11.59 in the third heat. They were the only two from their heat to advance. Defending state champ, Ariyonna Augustine of Long Beach Poly easily captured the 2nd heat in 11.65, pulling La Sierra's Mariah Allain and Madison's Aysha Shaheed (both at 11.95) along. Also qualifying from that second heat was Pittsburg's Trinity Bolden at 12.00. Considered the favorite by many, Stockdale's Aaliyah Wilson came back from the 100 Hurdles to capture the first heat at 11.72. Pushing her, Etiwanda's Ezinne Abba recorded a huge wind legal best of 11.79 while Redlands East Valley's Emerald Bowens qualified again with an 11.81. Serra's Jazmyne Frost sent a message once again with the fastest qualifying time, holding off Calabasas' DeAnna Nowling again, 23.65 to 23.97. Similar to the 100, they were the only two to qualify in their heat. Favorite Tierra Robinson-Jones of Bishop O'Dowd cruised to a 23.99 victory in the first heat, with El Toro's Maliyah Medley right behind her at 24.09 and Newark Memorial's Alexis Surrell at 24.35. In the 2nd heat, defending state champ Ariyonna Augustine from LB Poly rolled to a 23.82 victory. Like the 100 meters, she brought along three others to the finals. Santa Rosa's Kirsten Carter (24.30), Vista del Lago's Ceonna Pipion (24.38) and Upland's Jada Hicks (24.46). The ENTIRE field of nine qualified for the second individual event here with five coming back from the 400, three others from the 100 and Hicks from the 100 Hurdles. Bishop O'Dowd's Tierra Robinson-Jones did the bare minimum in capturing her heat at 55.05. With perhaps, some huge team title points in play, Serra's Jaylon Herron came in with a huge personal best of 55.29 while Chaminade's Bailey Umans' 55.44 also qualifying with a personal best. Newark Memorial's Alexis Surrell held form in her 55.23 victory in the 2nd heat. Quartz Hill's Alonna Johnson (55.65) and Vista del Lago's Ceonna Pipion (55.91) claimed those last two qualifying spots. El Toro's Maliyah Medley qualified for a 3rd straight state meet final as she recorded the fastest time with her 54.66 victory in the third heat. 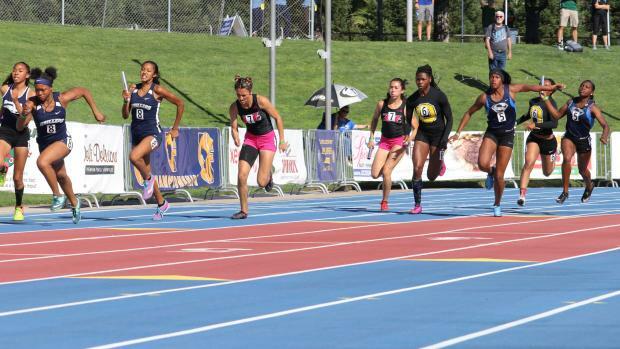 Santa Rosa's Kirsten Carter finished with a seasonal best of 55.12, just ahead of Chino Hills' Zani Meaders at 55.35. No real surprises here with our top five projected all advancing while seven of the nine are seniors. 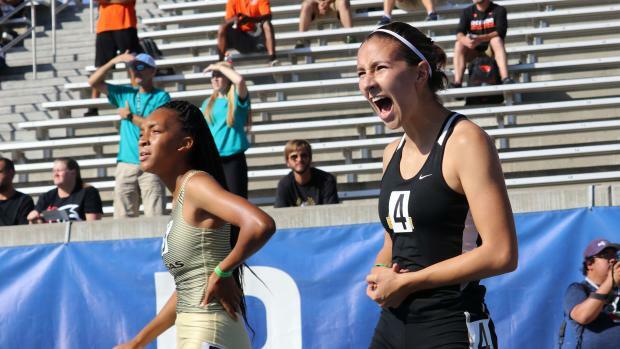 The real storyline here was the unfortunate news that two-time State Meet champion, Alyssa Brewer of California (NC) would not be able to compete. In one of the more conservative 800 meter prelims we've seen in quite some time, a 2:15.03 was the last qualifier. In the third heat, Del Oro's Cathilyn McIntosh roared home with a negative split 61.9 last lap to run the fastest time in the state at 2:07.64 and now the #3 time in the United States. Behind her and qualifying for her third State Meet final, Centennial's Rylee Penn cruised in with a 2:12.20, just ahead of Santa Cruz' Mari Friedman in 2:12.78. 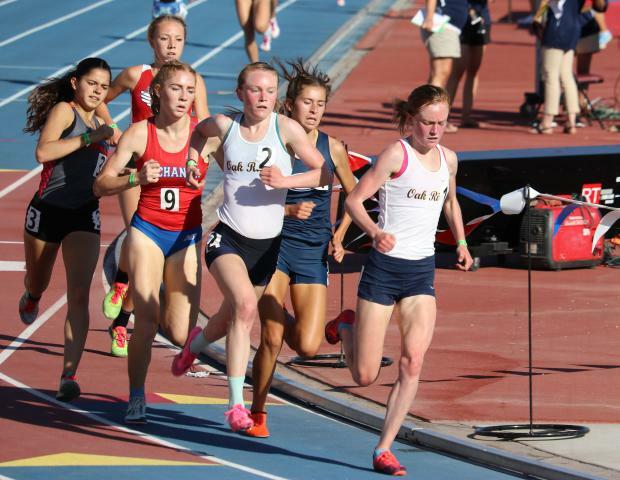 Friedman is the other girl in California that remains with a sub-2:10 to her name this season. Riverside Poly's Kalea Ibarra also qualified in that heat with a 2:13.10. Seventh at last year's state meet, Marymount's Malina Yago advanced once again by winning the first heat in 2:10.78. Top seed coming in, Concord's Rayna Stanziano crossed with her at 2:10.86 while Mission Viejo's Ashley Johnson (2:11.76) and Trinity's Lauren Harper (2:13.23) also advancing. In the second heat, Menlo's Charlotte Tomkinson crossed first with a 2:12.94. Los Alamito's Delaney Sanacore (2:13.30), Riverside JW North freshman Makayla Browne (2:14.06) and Julia Morales of Scripps Ranch (2:15.03) all advanced. In the closest picture of the day, Morales came in at 2:15.026, ahead of Alhambra's Marissa D'Atri at 2:15.027 to snag that last spot. In what should be the fastest 1600 meter final EVER in California State Meet history, most of the favorites advanced with ease. Defending state champ, Maddy Denner of Oak Ridge crossed first with a 4:47.48. Her sister, Elena (4:47.81) along with Saugus' Mariah Castillo (4:47.56) were all among the top five times that came from that loaded second heat. Coming home strong with a 68.5 last lap, Chino Hills' freshman, Jacqueline Duarte captured the first heat in 4:49.32, just ahead of state leader, Olivia O'Keeffe of Davis (4:49.92). Another freshman in Mayfield's Audrey Suarez posted another sub 4:50 effort in taking 4th in the 2nd heat with a 4:48.12 while Buchanan's Meagen Lowe was right behind her at 4:48.87. Rounding out the qualifiers, Village Christian's Mia Barnett (4:51.08), Great Oak's Fatima Cortes (4:51.26), Healdsburg's Gabrielle Peterson (4:51.38), Forest Lake Christian's Amber Jackson (4:51.59) advanced while La Costa Canyon's Jessica Reidman took that last spot at 4:52.99. Unfortunately, LCC's McKenna Brown could not overcome a recent illness and did not advance. Brown has the fifth fastest 1600 in California with a 4:45.46 (#7 in the USA). Also, the Great Oak trio finally broke up with Cortes being the only one to qualify, leaving Arianna Griffiths and Sandra Pflughoft, who led quite a bit of her heat before fading, on the outside. Pflughoft, a senior, is scheduled to come back tonight in the 3200. Cortes was had a best of 5:13 coming into the season and now advances onto the state meet final in 2018. With an explosive start that is unmatched at this state meet, Upland's Jada Hicks was on her game in roaring to a 13.24 victory in the first heat. This is the #2 time in the United States and now #7 in California state history. Jazlynn Shearer of Silver Creek rode the wave to a new personal best of 13.66 and the #3 time in the state thus far. Santa Margarita's Nikki Merritt also advanced in 14.06. Just off her #2 time in the state, Temecula Valley's Danae Dyer captured the third heat with a 13.67 wind aided effort, while also taking St. Anthony freshman Asjah Atkinson (14.10) and San Marcos' Allie Jones (14.11) to the final. In the second heat, Stockdale's Aaliyah Wilson ran away with a 13.81 wind legal victory. Roosevelt's Breanna Bernard-Joseph crossed at 14.02 while Edison's Cyvanna Bowen earned the last spot at 14.14. No surprises here as six seniors qualify with Hicks, Dyer, Bernard-Joseph and Jones all advancing once again. Back for her 3rd straight final, Roosevelt's Breanna Bernard-Joseph crossed first in the third heat at 42.33. But in a virtual tie, Segerstrom's Nyree Brown was there with her at 42.34. Kate Thomas of Torrey Pines earned the last spot at 43.54. Running out of lane nine last week but recording the top time in the state, Calabasas' Kyla Robinson-Hubbard won her heat in 42.52 with Ponderosa's Mackenzie Fletcher right with her at 42.96. Carter's Mya Greene also advanced with a 43.26. In the second heat, Nikki Merritt of Santa Margarita crossed first with a 42.63 while Vista's Alia Scott (43.21) and LB Poly's Kenya Payne (43.26) also advanced. No surprises whatsoever here as seven seniors advance. Serra and Calabasas rolled to new seasonal bests of 45.74 and 45.95, respectively. Serra's mark in the #2 time in the state as they were well ahead of fellow qualifiers, Bishop O'Dowd (47.15) and Olympian (47.36). Calabasas had to rely on Nowling on anchor to bring home the victory in the second heat. Sheldon crossed with a season's best of 46.43 while Arcadia continues to improve with a huge 46.80 performance. Santa Margarita also advanced from that same heat in 47.49. In somewhat of a head scratcher, Long Beach Poly won the 3rd heat with a time of 47.22 which was only the sixth-fastest time overall. All the same, they advanced while St. Mary's earned the last spot at 47.70, just ahead of Carson at 47.72. Carson (47.01 last week) was the only major hiccup in our projections. All of the favorites advanced here as the top team in California, Bonita captured the 2nd heat in 3:45.96. Alemany at 3:47.23, and Woodcreek at 3:51.13 also advanced. Quartz Hill returns back to the state meet finals once again in winning the first heat in 3:46.78 while Dana Hills was right behind them at 3:47.87 to also advance again. With four teams from that smoking first heat qualifying, Sheldon improved by over two seconds in rolling to a 3:48.00 while St. Mary's also posted a seasonal best in 3:50.13. The third heat witnessed Chino Hills winning in 3:48.57 while Serra' 3:48.93 may loom large in their team title aspirations. Serra owns the 3rd fastest time in the state going into tonight's festivities. With six squads coming in, projecting within seven points of one another, all major players advanced. We had Serra slated as a slight favorite for the team title and they only improved themselves based on prelims. Jazmyne Frost earned lane five for both her sprints while their 4x100 crew was sharp in also capturing the top seed. They received a boost from Jayla Herron in the 400 meters while they are the only one of our favored squads to have a team in the 4x400 relay. Deanna Nowling looked strong for Calabasas while impressing on her anchor leg of the 4x100 relay. Kyla Robinson-Hubbard looms large here as the favorite in the 300 hurdles. Defending state champions, Long Beach Poly's Ariyonna Augustine easily advanced. Despite their time in the 4x100 relay, they still won their heat and did what they had to do. Kenya Payne advancing in the 300 Hurdles was huge while they may need her to finish strong in her head to head battle with her Calabasas' counterpart. If Silver Creek's Jazlynn Shearer repeats her performances from Friday, along with Ariana Fisher, she could end up being THE headliner on Sunday morning. Both advanced as the top two in the Triple Jump while Shearer showed well in the 100 Hurdles and Long Jump as well. Bishop O'Dowd, led by Tierra Robinson-Jones along with the Denner twins of Oak Ridge will also be in the mix among the top six squads. Serra has five places to score while the rest have four spots to score. The title will be decided in the trenches of the 4x100 relay, the 100 and 200 meters while the 300 hurdles could loom large as well.